Salt is essential. Globally, humans eat an average of 10 grams a day and we each contain roughly 250 grams, without which we would die. IMAGE: Photograph courtesy Ryan Dewey. As Mark Kurlansky explains in his book, Salt, the extraction of salt has inspired many of the world’s most ambitious public works projects, while the exchange of salt laid down many of the global trade routes still in use today. As Kurlansky tells it, the Chinese developed an advanced system of urban plumbing inspired by their advances in salt-well bamboo pipework, the Romans built the first of their great roads, the Via Salaria, to bring salt into the interior of the Italian peninsula, and settlements all over the world—including Buffalo, New York—were situated at salt licks, to which convenient paths had already been blazed by animals (in that case, bison). The salt at the end of the longest, most infrastructure-intensive supply chain in the world, however, is the salt from Improbable Oceans. 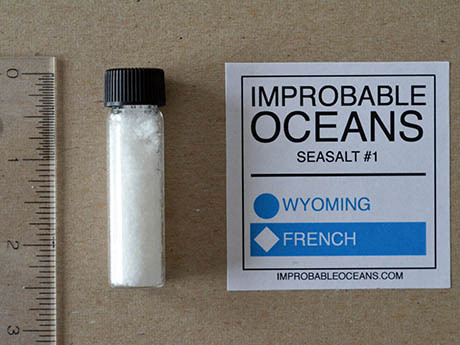 Artist and cognitive scientist Ryan Dewey is currently running a Kickstarter campaign to fund the production of what he describes as “the first true sea salt from oceans that don’t exist.” Its production process combines two elemental commodities that are shipped vast distances around the world only to be marketed based on their taste of place: mineral water and sea salt. The result is small-batch, hand-harvested salt that captures the taste of two places that could never overlap outside the totalising geography of the grocery store—salt evaporated from the Wyoming-French ocean, for example, or the New Zealand-Icelandic sea. The project began with kitty litter. Dewey is principal of the Geologic Cognition Society, a collective he founded in 2013 to attempt to make geologic timescales and forces more legible to humans. The minerals in the kitty litter on the shelves in an average Walmart may well, Dewey realised, have been mined in Wyoming, travelled by train to California, sailed to China to be processed, returned back to California by sea, and then traversed half way across the country again, via a central distribution center, to your store. 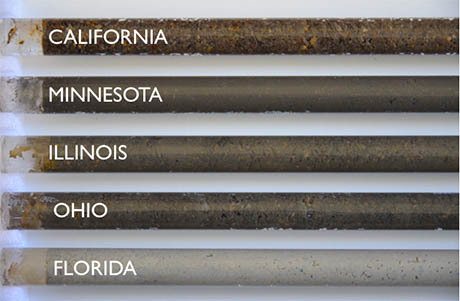 At first, Dewey began assembling core samples of the mobile minerals available at your average supermarket: kitty litter, activated charcoal, pumice, and, of course, salt. The core samples were a tool, he explained, to help visualise “these imagined spaces that exist at the convergence of supply chains and retail inventory.” But, while he was scanning the shelves, he realised that, between the gourmet salt selection and the aisle of mineral waters, the grocery store was home to hundreds of latent oceans, each of which could yield an as-yet-untasted salt. 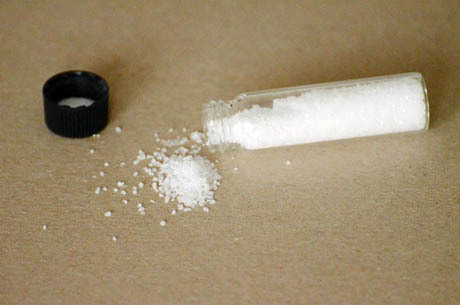 With no particular effort, Dewey was able to assemble ten mineral winters from across the globe—Hawaii, New Zealand, Fiji, Iceland, Norway, Croatia, England, France, Wyoming, and Ohio—and ten salts from equally far afield: Hawaii, South Africa, Pakistan, California, Portugal, France, New Zealand, South Korea, Sweden, and New York. This immediately gave him the ability to make one hundred different improbable oceans in his Cleveland lab, in which the trace minerals that give Fiji water its particular flavour mingle with, for example, the unique “merroir” of Hawaiian sea salt. The result, after steam-condensing the ocean into a brine and then evaporating off the remaining water, is a seasoning whose taste perfectly captures the geography-distorting anyplace of the global supply chain. 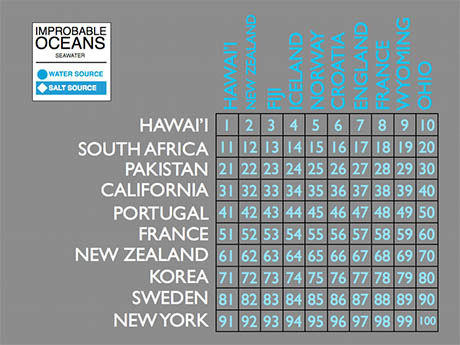 The most improbable ocean, ranked purely on the mileage required to bring its two ingredients together in Dewey’s Cleveland base, is formed by the combination of New Zealand water with Portuguese salt. 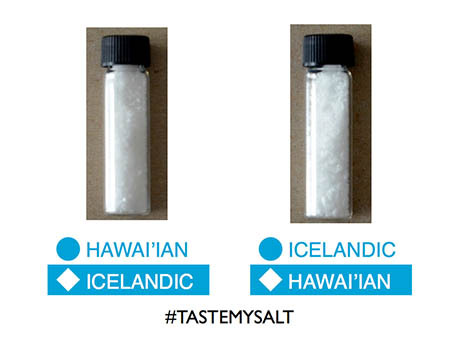 Foodies eager to taste these varying degrees of improbability themselves can choose to order single 2-dram vials of the New Zealand-Portuguese salt, inverse salt pairs, or entire flights. The experience does not come cheap—Dewey thinks that his salt is almost undoubtedly the most expensive in the world, which is only fitting when you consider the resource-intensive supply chain that lies behind each improbable ocean (not to mention the time-consuming process of evaporating each micro-batch by hand). Alongside the production process, Dewey plans to continue his exploration of how global supply chains shift geology, collapse geography, and create new kinds of places—as well as the products that express them. He is experimenting with ageing his oceans, in order to reintroduce some kind of temporal variability into his salts. 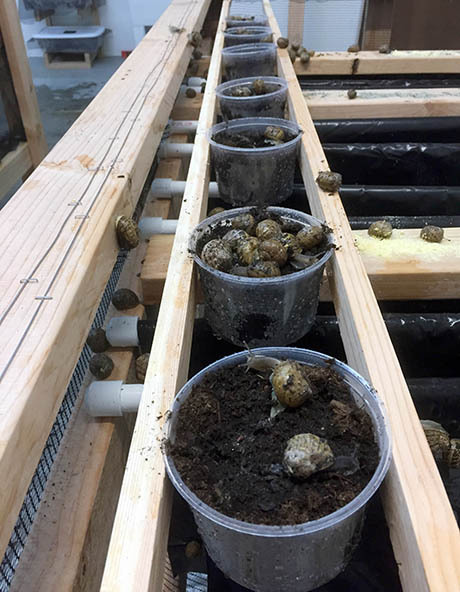 And he is planning to expand his harvest to include oysters: perhaps, he hopes, ending up with bivalves that have adapted over multiple generations to the particular waters of an improbable ocean. Visit Dewey’s Kickstarter page for your chance to taste the ineffable, improbable flavours of global trade and anthropogenic geo-engineering. This is salt that can only exist at this particular moment in planetary history—salt that the ancient Chinese and Romans, for all their infrastructural ingenuity, could never have imagined. It combines the abstract logic of capital with the artisanal craft of micro-local production in seasoning form. Its ridiculousness is precisely the point. Why does grape candy taste so fake? What on earth is blue raspberry, anyway? And what is the difference between natural and artificial, at least when it comes to flavour? Join us as we taste the rainbow on this episode of Gastropod, from artificial flavouring’s public debut at the 1851 Crystal Palace exhibition, to the vanilla-burping yeasts of the future. We’ll experiment with Skittles, discover how invented flavours first appeared in our daily diets, and visit a synthetic biology lab, all in our quest to understand what artificial flavour is, was, and might be. Along the way, we’ll learn what exactly goes into designing the perfect pineapple from one of America’s top flavourists, investigate beaver butts, and discover the taste of an extinct banana. Listen now! Throughout human history, if you wanted to make a dish taste like strawberry, you had no choice but to add a strawberry. But in the 19th century, scientists began to understand how to synthesise flavour chemicals, whether from plants or from byproducts of coal processing, to evoke familiar flavours. While the technology to evaluate the flavour molecules of a particular food have become increasingly sophisticated in the past century, the basic concept of synthetic flavour has remained unchanged. Until now. In this episode of Gastropod, molecular biologists explain how they’re designing yeasts to ferment the tastes of the future. 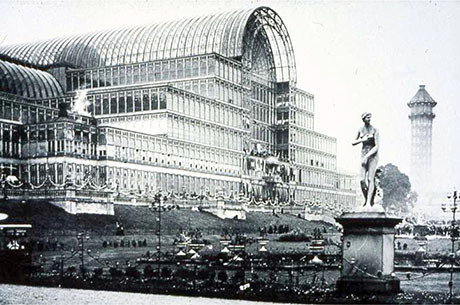 IMAGE: The Great Exhibition of 1851 was housed in Joseph Paxton’s extraordinary Crystal Palaces, and contained “the wonders of industry and manufacturing from around the modern world,” including folding pianos for yachtsmen, a couple of velocipedes (the early version of a bicycle), and, of course, some lozenges flavored with artificial fruit ethers. Let’s start with a graham cracker. Just like Sylvester Graham back in 1829, if you’re baking at home, you’d probably use coarse-ground whole-wheat flour, wheat bran, and wheat germ. These, along with some honey for sweetness, would give your graham crackers their distinctive toasty, malty, and slightly nutty flavor. If you’re making them by the billion, however, at a Nabisco or Keebler factory, the ingredients list looks a little different. That extra wheat germ and bran contain natural oils with a tendency to go rancid—but, when you cut them out to gain shelf-life, you lose the flavour. Fortunately, there’s an easy solution: you can add all that flavour back with just a touch of a light yellow, crystalline powder called 2-acetylpyrazine. 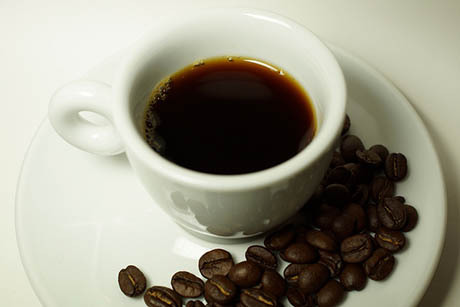 This is an aromatic, carbon-based chemical, known by flavourists as the “graham-cracker” flavor. It occurs naturally in nuts and toasted grains; as the vital ingredient giving factory-made graham crackers their signature flavour, it can either be extracted from a plant or synthesised using petrochemical derivatives. The major difference is that 2-acetylpyrazine produced by performing chemical reactions on plant matter costs about $25 per lb—compared to the $5 or $6 per lb it costs to produce the kind whose raw ingredients come in a drum. In fact, Michelle Hagen, a senior flavourist at Givaudan, the world’s largest fragrance and flavour company, told Gastropod that, despite the cost savings, she hasn’t used a single artificial chemical in her flavourings for the past four years—because the companies she mostly works with know that customers are turned off when they see that word on a label. Until recently, the natural flavours that Hagen uses would, for the most part, have been extracted from a plant; a handful of rarer ingredients, more often used in perfumery, would have come from animal sources. Today, advances in genetic engineering, combined with the growing consumer demand for natural flavours, are creating an intriguing new option for the world’s flavourists. In the past, the mention of “edible yeast” in the FDA definition of natural flavours typically referred to savoury yeast extracts; now, designer yeasts are beginning to pump out vanilla, saffron, and even grapefruit flavours. 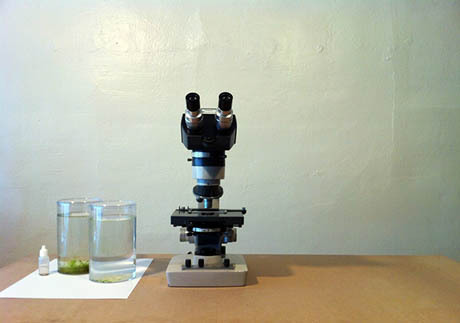 For this episode, Gastropod visited Ginkgo BioWorks, one of a new wave of companies redesigning yeasts to produce fragrance and flavour chemicals. As Christina Agapakis, a scientist, writer, and artist who recently joined Ginkgo’s staff, explained, the biology behind genetically modifying microbes to produce other, useful chemicals is not new. More than three decades ago, in 1978, biotech companies successfully inserted genes into bacteria to produce human insulin, meaning that diabetics need no longer depend on a close-enough version extracted from pig pancreases. 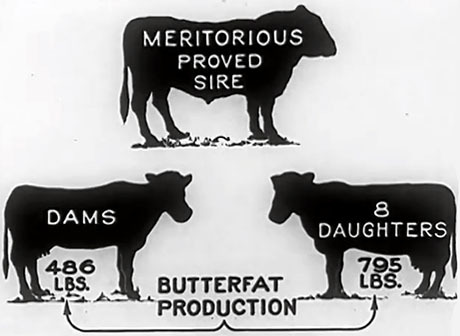 In 1990, the FDA approved rennet made by inserting cow genes into E. coli bacteria; today, more than 90 percent of all cheese in the U.S. and U.K. is made using this bio-engineered product, rather than natural rennet found in the stomach linings of calves. What is new, Agapakis told Gastropod, is “the ability to create flavors.” Rather than inserting the single gene that codes for the insulin protein, she explained, “to make a flavour, you might need five or ten different enzymes that are creating a whole pathway and are really shifting the metabolism of the yeast.” Fitting all those genes together so that what works in a plant to produce flavour also works in a yeast cell is challenging. Ginkgo has been developing its first yeast-fermented ingredient—a rose oil for the fragrance industry—for a couple of years now. Still, a Swiss company called Evolva has recently brought the first of these “cultured flavours” to market: vanillin, the main ingredient in the world’s most popular flavour. Ginkgo’s rose oil smells pretty sweet, and the Boston-based company has half a dozen more flavour ingredients in the pipeline. 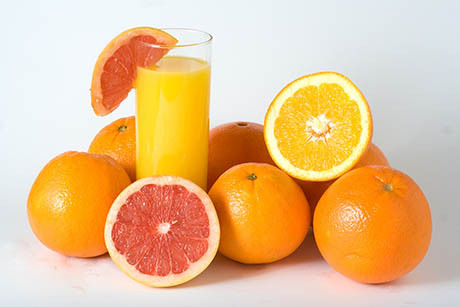 And scientists in Austria just announced that they have successfully tweaked yeast to produce the key flavour chemical in grapefruit. 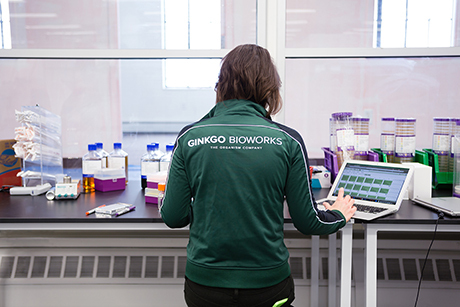 IMAGE: Photo courtesy Ginkgo BioWorks. But the main attraction of this new technology for food companies is that the resulting flavours can legally be labelled as “natural”—they are produced by a yeast, after all. What’s more, because there is no yeast left in the final product, cultured flavours actually don’t contain genetically modified organisms. Still, companies are nervous—Michelle Hagen at Givaudan told Gastropod that she hadn’t worked with any of these cultured flavours yet, and both Nestlé and General Mills responded to pressure from Friends of the Earth by pledging not to use cultured vanillin. In a press release, Friends of the Earth argued that using yeast to produce vanillin would threaten the livelihood of vanilla bean farmers in Madagascar, as well as the continued existence of the rainforest in which the vanilla orchid grows. But, as Patrick Boyle pointed out, the world demand for vanillin far outstrips the quantity of vanilla beans grown each year, and the synthetic and real vanilla industries have already managed to co-exist for more than a century. Debates over natural vs. artificial aside, perhaps the most interesting aspect of these designer yeasts is the potential they offer for creating entirely new flavour experiences. For Christina Agapakis, the opportunity to learn more about the genes and pathways that plants use to express flavour will, she hopes, lead to productive collaborations with fruit and vegetable breeders—and increased deliciousness in the field as well as in the lab. Meanwhile, while the Jurassic Park-style idea of recreating extinct species from some DNA trapped in amber is still a fantasy, Agapakis speculated that it might be possible to work with evolutionary biologists to reconstruct the genetics of lost plants from their living relatives. One day, designer yeast could allow us to get close to the flavour of extinct or endangered species, or even pre-domestication grasses and animals. 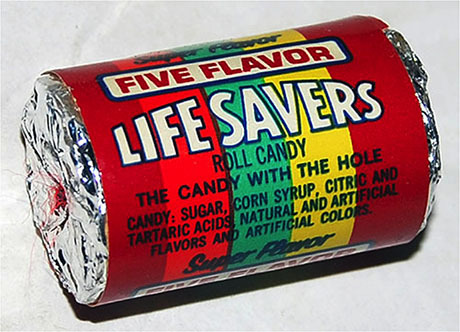 To end where we began: forget whether your graham cracker uses natural or artificial flavours. Instead, imagine a series of crackers whose flavours progress through wheat’s evolutionary history. Then listen to this episode of Gastropod to understand how the flavour industry got started, and what its evolution can tell us about our relationship with food. Cheese is the chameleon of the food world, as well as one of its greatest delights. 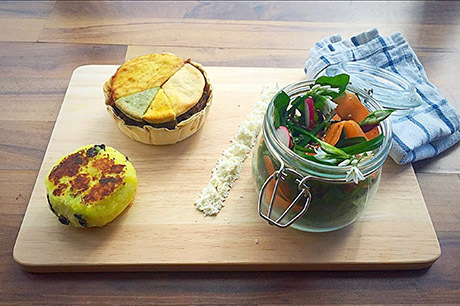 Fresh and light or funky and earthy, creamy and melty or crystalline and crumbly—no other food offers such a variety of flavours and textures. But cheese is not just a treat for the palate: its discovery changed the course of Western civilization, and, today, cheese rinds are helping scientists conduct cutting-edge research into microbial ecology. In this episode of Gastropod, we investigate cheese in all stinking glory, from ancient Mesopotamia to medieval France, from the origins of cheese factories and Velveeta to the growing artisanal cheese movement in the U.S.. Along the way, we search for the answer to a surprisingly complex question: what is cheese? Join us as we bust cheese myths, solve cheese mysteries, and put together the ultimate cheese plate. This is the story you’ll often hear about how humans discovered cheese: one hot day nine thousand years ago, a nomad was on his travels, and brought along some milk in an animal stomach—a sort of proto-thermos—to have something to drink at the end of the day. But when he arrived, he discovered that the rennet in the stomach lining had curdled the milk, creating the first cheese. Unfortunately, there’s a major problem with that story, as University of Vermont cheese scientist and historian Paul Kindstedt told Gastropod: the nomads living in the Fertile Crescent of the Middle East in 7000 B.C. would have been lactose-intolerant. A nomad on the road wouldn’t have wanted to drink milk; it would have left him in severe gastro-intestinal distress. Kindstedt, author of the book Cheese and Culture, explained that about a thousand years before traces of cheese-making show up in the archaeological record, humans began growing crops. 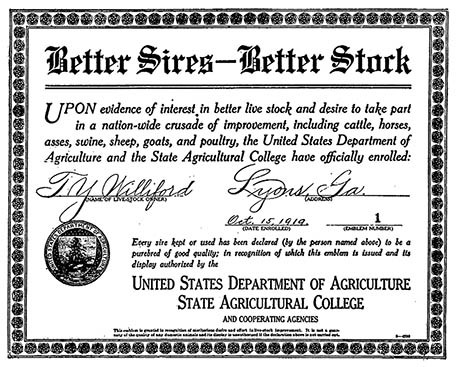 Those early fields of wheat and other grains attracted local wild sheep and goats, which provide milk for their young. Human babies are also perfectly adapted for milk. Early humans quickly made the connection and began dairying—but for the first thousand years, toddlers and babies were the only ones consuming the milk. Human adults were uniformly lactose-intolerant, says Kindstedt. What’s more, he told us that “we know from some exciting archaeo-genetic and genomic modeling that the capacity to tolerate lactose into adulthood didn’t develop until about 5500 BC”—which is at least a thousand years after the development of cheese. The real dawn of cheese came about 8,500 years ago, with two simultaneous developments in human history. First, by then, over-intensive agricultural practices had depleted the soil, leading to the first human-created environmental disaster. As a result, Neolithic humans began herding goats and sheep more intensely, as those animals could survive on marginal lands unfit for crops. And secondly, humans invented pottery: the original practical milk-collection containers. 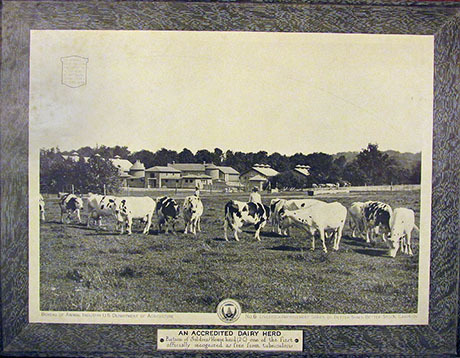 In the warm environment of the Fertile Crescent region, Kinstedt explained, any milk not used immediately and instead left to stand in those newly invented containers “would have very quickly, in a matter of hours, coagulated [due to the heat and the natural lactic acid bacteria in the milk]. And at some point, probably some adventurous adult tried some of the solid material and found that they could tolerate it a lot more of it than they could milk.” That’s because about 80 percent of the lactose drains off with the whey, leaving a digestible and, likely, rather delicious fresh cheese. Rind microbes from a Colston Bassett Stilton. 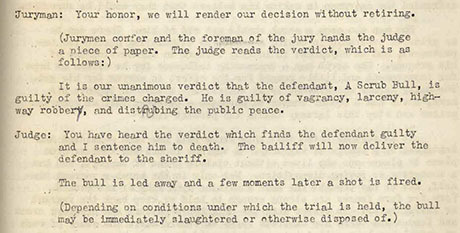 Photograph courtesy of Benjamin E. Wolfe. In lieu of an actual time machine, Gastropod has another trick for listeners who want to know what cheese tasted like 9,000 years ago: head to the local grocery store and pick up some ricotta or goat’s milk chevre. These cheeses are coagulated using heat and acid, rather than rennet, in much the same way as the very first cheeses. Based on the archaeological evidence of Neolithic pottery containers found in the Fertile Crescent, those early cheeses would have been made from goat’s or sheep’s milk, meaning that they likely would have been somewhat funkier than cow’s milk ricotta, and perhaps of a looser, wetter consistency, more like cottage cheese. So, the next time you’re eating a ricotta lasagne or cheesecake, just think: you’re tasting something very similar to the cheese that gave ancient humans a dietary edge, nearly 9,000 years ago. 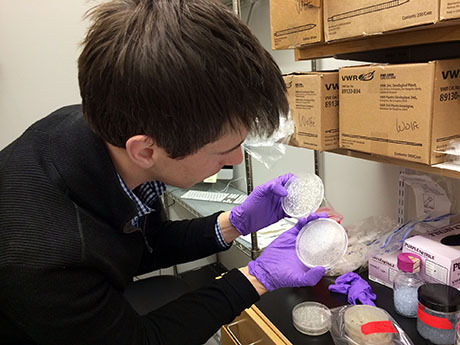 Ben Wolfe examining his in-vitro cheeses for signs of life. Photograph by Nicola Twilley. Those early cheese-making peoples spread to Europe, but it wasn’t until the Middle Ages that the wild diversity of cheeses we see today started to emerge. In the episode, we trace the emergence of Swiss cheese and French bloomy rind cheeses, like Brie. 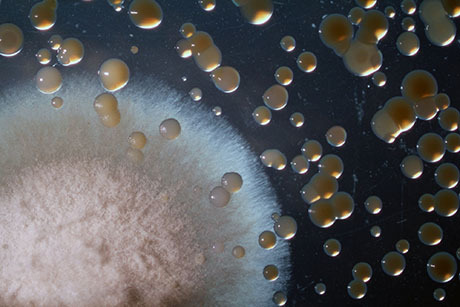 But here’s a curious fact that didn’t make it into the show: when Gastropod visited Tufts microbiologist Benjamin Wolfe in his cheese lab, he showed us a petri dish in which he was culturing the microbe used to make Camembert, Penicillium camemberti. And it was a gorgeous blue-green colour. Wolfe explained that according to Camembert: A National Myth, a history of the iconic French cheese written by Pierre Boisard, the original Camembert cheeses in Normandy would have been that same colour, their rinds entirely colonized by Wolfe’s “green, minty, crazy” microbe. 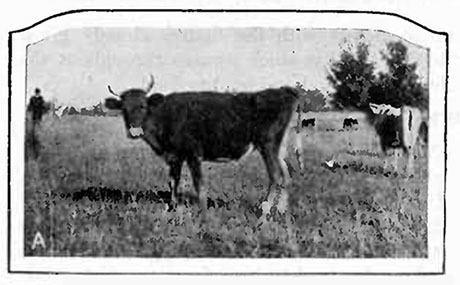 Indeed, in nineteenth-century newspapers, letters, and advertisements, Camembert cheeses are routinely described as green, green-blue, or greenish-grey. In his book, Boisard attributes the rapid rise of the white mutant to human selection, arguing that Louis Pasteur’s discoveries in germ theory at the start of the twentieth-century led to a prejudice against the original “moldy”-looking green Camembert rinds, and a preference for the more hygienic-seeming pure white ones. Camembert’s green origins have since been almost entirely forgotten, even by the most traditional cheese-makers. 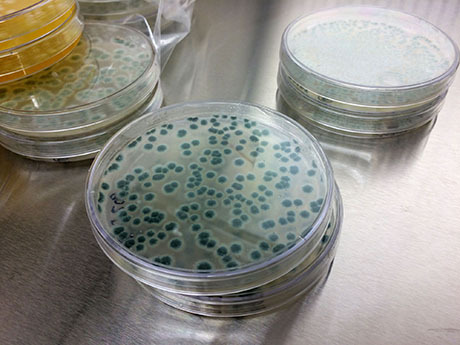 Penicillium camemberti growing in a petri dish in Ben Wolfe’s lab. Photograph by Nicola Twilley. Listen to this week’s episode of Gastropod for much more on the secret history and science of cheese, including how early cheese bureaucracy led to the development of writing, what studying microbes in cheese rinds can tell us about microbial ecology in our guts, and why in the world American cheese is dyed orange. 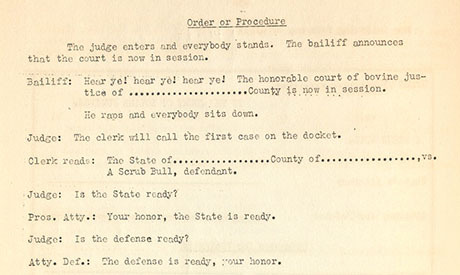 (Hint: the color was originally seen as a sign of high quality.) Plus, Gastropod will help you put together the world’s most interesting cheese plate to wow guests at your next dinner party. Step away from the French fries—and even from that bag of pre-washed mixed greens lurking in the crisper drawer. It’s time to reconsider the potato and up your salad game. In this episode of Gastropod, Cynthia and Nicky talk to science writer Ferris Jabr about the chestnut-flavored, gemstone-hued potatoes he discovered in Peru, as well as the plant breeders working to expand American potato choices beyond the Russet Burbank and Yukon Gold. Plus we meet wild gardener Stephen Barstow, whose gorgeous megasalads include 537 different plants, to talk about ancient Norwegian rooftop onion gardens and the weedy origins of borscht. 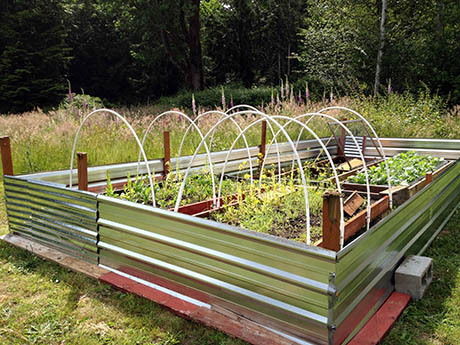 If you thought you knew your veggies, think again—and listen in! Have you ever wondered how to avoid sandwich sogginess, what scented soap to pair with your restaurant order, and whether airplane food can be made to taste of anything at all? Dan Pashman, host of The Sporkful, has, and his new book, Eat More Better, is filled with deeply researched, science-based hacks to improve your everyday eating. In this episode of Gastropod, Pashman shares his pro tips and dream lunchbox design: listen, learn, and win a copy of his book for yourself. IMAGE: “Die Glühbirne,” 2015, from “The Light Inside,” photograph by Radu Zaciu. German slang for light bulb is “die Glühbirne,” or “the glow pear.” As Romanian photograph Radu Zaciu explained to Petapixel, his latest series, “The Light Inside,” was originally inspired by this word play. 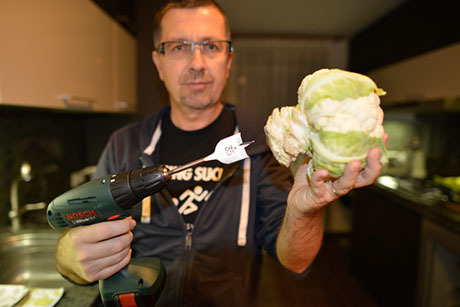 IMAGE: Photograher Radu Zaciu preparing a cauliflower; photograph via Petapixel. 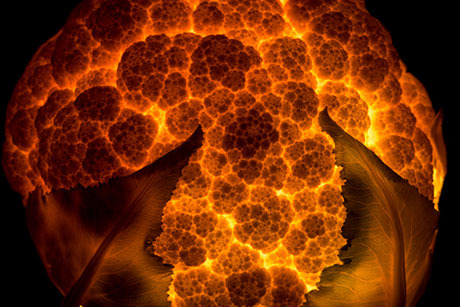 IMAGE: “Apocalypse Now—The Cauliflower,” 2015, from “The Light Inside,” photograph by Radu Zaciu. 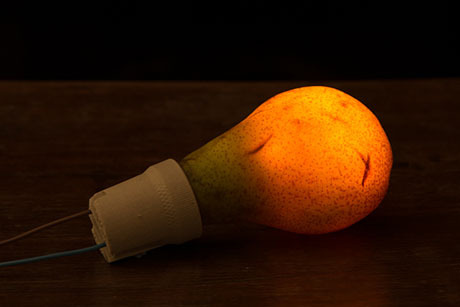 Starting with a pear, Zaciu has been drilling and carving holes into fruits and vegetables, inserting a light bulb, and then photographing the glowing produce in a darkened room. The results are gorgeous, from the liquid magma of the cauliflower to the delicate, protoplasmic green waves of a tightly furled cabbage. 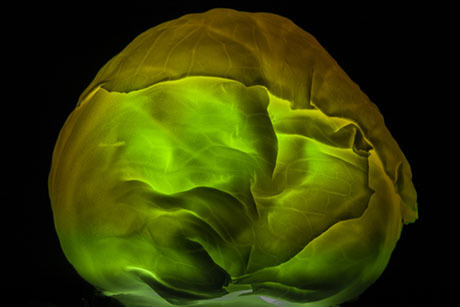 IMAGE: “Cabbage–green,” 2015, rom “The Light Inside,” photograph by Radu Zaciu. 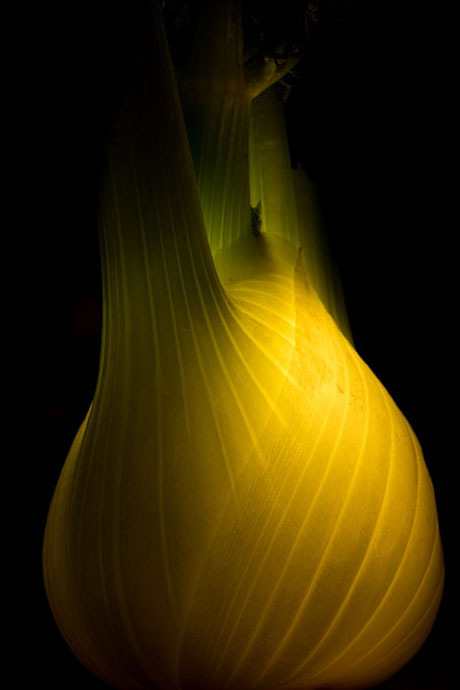 IMAGE: “Fennel,” 2015, rom “The Light Inside,” photograph by Radu Zaciu. Visit Zaciu’s Flickr page for more photographs in the series and Petapixel for more detail on his technique. You may also enjoy this Edible Geography review of Abigail Carroll’s Three Squares from November 2013.